Districts across the country are beginning to focus on personalized learning for students and staff. As we look for ways to meet students where they are on the educational playing field, blended learning’s flexible style is a natural fit. One way that this can be accomplished is through creating courses that are a hybrid model of in-class traditional instruction and online classroom instruction. This blended-learning format has been successful at the college level for years, but is now just starting to become a trend in high schools. Blended learning sounds like a curriculum- and instruction-level issue, but in reality the school librarian must be included in this process starting at the ground level. 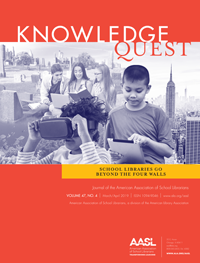 The blended learning-ready school librarian uses their knowledge of space and resources to make the blended-learning format successful. This fall our district formed a blended learning committee that included curriculum and development administrators; staff interested in teaching a blended-learning course; and instructional technology specialists and school librarians interested in innovative practices. As a committee the journey began by reading The Blended Course Design Workbook by Kathryn E. Linder. For school librarians the most relevant chapters are 1 and 9. Chapter 1 covers the fundamentals of blended learning, what it is and what it looks like. Chapter 9 discusses how students and staff will find resources, and this was a natural fit for the school library. 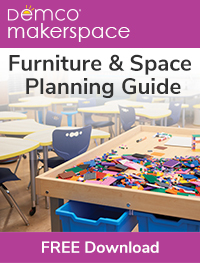 This book does not have a specific section on blended-learning spaces and design, but rather focuses on information and adjustments. The blended-learning model encourages flexibility in space design, which allows for personalizing your space based on your school’s needs. Curating content for teachers that address students’ needs using educational resources from a variety of sources. Providing learning experiences through literacy, research, and inquiry in the physical and digital environment. Supporting our school communities on ethical use (copyright, fair use, etc.) as they create. Designing the physical space to be flexible, open, and defined. Curating an updated professional learning collection that supports blended learning. 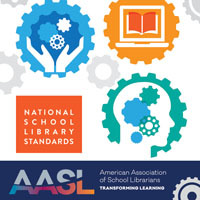 The roles listed above were created during our committee work using the “Blended Learning: ESSA Definition and How It Impacts School Libraries and Librarians.” We incorporated language from the ALA Standards Framework for Learners and our own goals and thoughts on the topic. The next step was creating a vision for the library space and resource needs of my school. 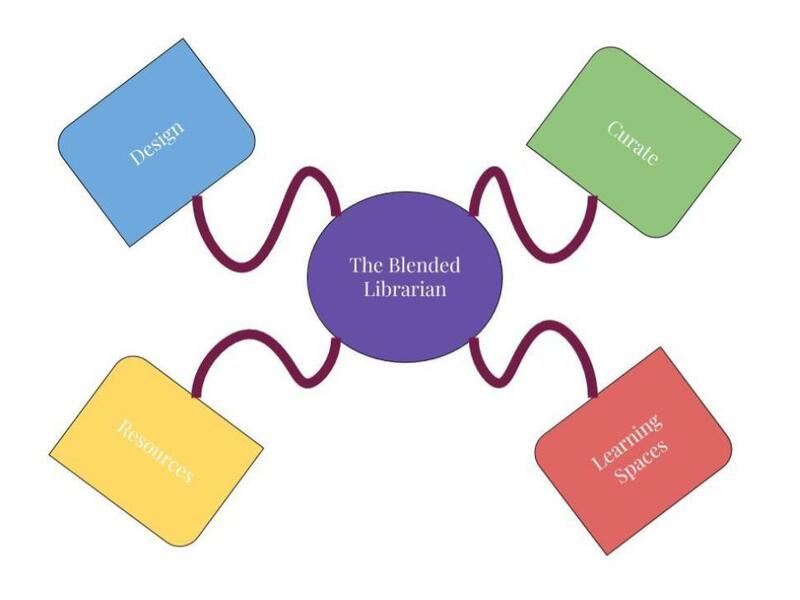 Together with my cross-river district partner high school librarian, Ben Wagoner, we created a “Role of the Blended Librarian” framework and graphic to help guide our work. The framework will be a fluid document that will change over time as we dive into this new learning style, adding and adjusting our roles as we need to once our blended-learning courses roll out next fall. Blended learning is grounded in adjustments and our roles in this process will be no exception. As of today our current committee step is evaluating learning management system (LMS) products for adoption into our district. TechTarget defines an LMS as “a software application or Web-based technology used to plan, implement, and assess a specific learning process. Typically, a learning management system provides an instructor with a way to create and deliver content, monitor student participation, and assess student performance.” From our initial readings in The Blended Course Design Workbook, we saw that choosing an LMS that works for your district’s students and staff is key. The system that you select will manage student work, grades, communications, and assignments. We are already a Google Apps for Education district, but the options and depth that an LMS can go into far exceeds that of what Google Classroom can do right now. With an LMS teachers have an increased amount of control and monitoring options that are specifically needed in a blended type of learning environment since they will not be physically meeting everyday. The vendors that we chose to look at are Schoology and Canvas. Both are very highly rated among users and have been used in school districts around us that are already implementing blended learning courses. After viewing both presenters and talking with committee members it seems like Schoology will be the way we go, but no decisions have been made at this point. As our committee work continues, as a team we will be moving forward on planning which content areas and courses will start the process first, which LMS is our final decision, and course development. My focus will primarily be on the spacial changes that need to be made in my library before next school year. Working on creating individual and quiet work spaces will be key. The current setup of my library is extremely open, so finding ways to split the space into more individualized learning environments will be a challenge. Personalizing student learning is the goal with introducing a blended-learning format into our course offerings. School librarians should promote cooperation with staff and administration in creating learning spaces, resources, curation, and design. 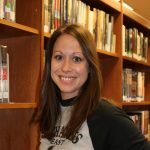 We can use this new format as a way to bring new resources and patrons into our school libraries and cultivate that “heart of the school” feeling. Blending traditional and technology-based educational practices will mean a whole new role shift for the Blended Ready Librarian.